As a family caregiver, you play the most important role in the care of your loved one with ALS. Your experience will surely be physically and emotionally demanding. It will require you to learn new skills and will draw out courage and strength in you that you may not have known you possess. Give the gift of accepting help – often others want nothing more than to help you and your loved one during this difficult time. When others ask what they can do to help, take them up on their offer! Scheduling a time for a friend or family member to provide respite care gives them a chance to help, and provide support to your loved one, while giving you space for self-care. When your loved one has respite care, use that time for yourself. The grocery shopping, housework, and other tasks will always be there. Take those precious moments to yourself to relax, recharge and rejuvenate yourself. When you are energized and at your best, you are able to be fully present and available in your caregiver role. During this difficult journey, it is important to make time to take care of yourself. This may seem impossible at times, when you are so busy taking care of your loved one. However, if you are not well, you cannot help your loved one to be well. It’s like being on an airplane when there’s an emergency – you are always instructed to secure your own oxygen mask first, before helping your loved one put theirs on. The same is true in life, especially for caregivers. You must care for yourself before caring for someone else. As difficult as this principle may be to follow at times, there are small, simple things you can do every day to ensure you are at your best. Listen to relaxing music in the car. Step outdoors for a breath of fresh air. You can use the ideas above, or add your own! During this difficult journey, it is important to seek support, and use it often. Below are some resources to get you started. 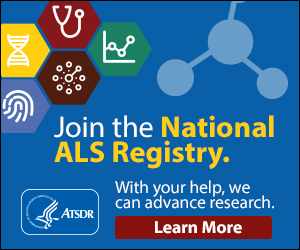 “ALS Chat” by ALS forums is a volunteer resource providing an internet vehicle for information, discussion, and support for anyone affected by ALS. Both pALS and caregivers can register for free. Creating a support community via an on-line resource. This website provides resources for caregivers and Veterans, including resources available to caregivers, and videos and stories of caregivers of Veterans. The website has a zip code look up feature allowing caregivers and Veterans to find the name and contact information of the closest Caregiver Support Coordinator. There is also a toll free number: 1-855-260-3274. This website offers resources, stories, and newsletters about caring for someone with Medicare. A quick checklist of things to consider when taking a loved one to the doctor. The ALS Association website provides links to all of the regional chapters’ websites, where you can find more information on local support groups and events, and find contact information for local representatives. ALS of Michigan hosts free, open support groups especially for caregivers of people with ALS. To be added to a support group reminder mailing list please call (800) 882-5764. This webpage provides a link to the brochure, Caregiving…When a Loved One Has ALS, including a brief list of resources for caregivers of people with ALS. Click the menu options on the left side of the page to access information on respite care, coping with burnout, and caregiving tips and hints. This guide provides comprehensive instructions for caregivers who care for a loved one with ALS. It helps caregivers understand the progression of the disease, and shares quotes and advice from other caregivers. It can be accessed online, and downloaded as a PDF file.